This study examined vegetation greening at two arctic sites: the Apex River Watershed (ARW), Baffin Island, Nunavut (a Low Arctic site) and the Cape Bounty Arctic Watershed Observatory (CBAWO), Melville Island, Nunavut (a High Arctic site). The vegetation at both study sites was characterized using a supervised land-cover classification approach using high spatial resolution satellite remote sensing data (i.e., IKONOS [4 m] and WorldView-2 [2 m]). Meanwhile, Normalized Difference Vegetation Index (NDVI) data spanning the past 30 years were derived from intermediate spatial resolution data (i.e., Landsat TM/ETM/OLI [30 m]). The land-cover classifications were used to partition the Landsat NDVI time series by vegetation type. Climate variables (i.e., temperature, precipitation, and growing season length [GSL]) were examined to explore potential relationships of NDVI to climate warming trends. The results of the land-cover classifications demonstrated inherent trends of vegetation types along elevation and moisture gradients. The NDVI time series for the CBAWO (1985–2015) demonstrated an overall significant increase in greening, specifically in the dry and mesic vegetation types. Conversely, similar greening (overall or by vegetation type) was not observed for the ARW (1984–2015). Based on climate data from the nearest permanent weather station (Mould Bay, Nunavut), the overall increase in NDVI at the CBAWO was largely attributed to a significant increase in July temperatures and GSL. Global air surface temperatures have increased over the past several decades with the most rapid warming occurring in the Arctic (ACIA, 2004; Barber et al., 2008; AMAP, 2011; IPCC, 2013). Meanwhile, global circulation models (GCMs) estimate that arctic regions are likely to warm by several degrees over the next century (Huemmrich et al., 2010). These climatic changes in the Arctic will have notable, but variable impacts on tundra ecosystems; hence they are difficult to predict spatially and temporally. Impacts will include changes to sea ice cover, snow cover accumulation, hydrologic patterns, growing season length (GSL), permafrost (degradation/aggradation), vegetation productivity and biomass accumulation. Individually, and in concert, these impacts will culminate in varied stresses to northern communities (ACIA, 2004, AMAP, 2011; IPCC, 2013; Abbott et al., 2016). The satellite record has revealed that vegetation biomass and productivity in tundra ecosystems have already begun to change, resulting in a spatially variable trend of “Arctic greening” that is coincident with changes in surface temperatures (ACIA, 2004; Stow et al., 2004; Jia et al., 2009; Zeng et al., 2011; IPCC, 2013; Xu et al., 2013; Pearson et al., 2013; Fraser et al., 2011, 2014; Guay et al., 2014; Meyers-Smith et al., 2015; Moffat et al., 2016; Ju and Masek, 2016). For instance, the increase in vegetation productivity has been associated with an earlier onset of “green-up” and an extension of the growing season (i.e., phenological changes) (Walker et al., 2006). The overall greening trend that has been observed over the satellite record has been supported by field experiments where warming simulations (Hollister et al., 2005; Walker et al., 2006; Elmendorf et al., 2012) and dendrochronology studies (Forbes et al., 2010; Myers-Smith et al., 2015) have been conducted. However, more recently, there is substantial evidence of “Arctic browning” in various regions of the circumpolar Arctic (Bjerke et al., 2014; Phoenix and Bjerke, 2016; Epstein et al., 2016), which has been attributed to an extended snow cover period (Bieniek et al., 2015) and reduced summer warmth index (SWI; sum of degree months above freezing) (Bhatt et al., 2013). Whether this is a temporary phenomenon, or an indication of a more systemic response to warming is yet to be determined (Phoenix and Bjerke, 2016). Alterations to vegetation processes and structure that have been observed in the Low and High Arctic have been linked directly to climate warming (ACIA, 2004; Bhatt et al., 2013; IPCC, 2013; Tingley and Huybers, 2013). This increased warming will also drive other climate variables that will have an impact on vegetation change such as: (1) increased precipitation because of the early melt and loss of sea ice in the spring (Kattsov and Walsh, 2000; Gamon et al., 2013; Boisvert and Stroeve, 2015); (2) reduced snow cover in the spring as a result of early onset of snowmelt (i.e., longer growing season) (Hinzman et al., 2005; IPCC, 2013); (3) altered soil moisture conditions that are largely controlled by snow accumulation and drainage and linked to permafrost thaw (Hinzman et al., 2005; Collingwood et al., 2014); and (4) increased nutrient availability as a result of amplified leaf litter inputs (Welker et al., 2005). Information derived from remote sensing data has greatly advanced our understanding of the Earth system, particularly with respect to vegetation processes. Remote sensing derivatives, such as the Normalized Difference Vegetation Index (NDVI) and time series satellite observations, have already provided evidence suggesting the Arctic is experiencing extended growing seasons and enhanced greening (Epstein et al., 2012; Bhatt et al., 2013; Gamon et al., 2013). NDVI is a remotely sensed measure of vegetation greenness related to the structural and physiological properties of the leaf, plant productivity, percent vegetation cover, and biomass (Laidler et al., 2008; Atkinson and Treitz, 2013; Forkel et al., 2013; Johansen and Tømmervik, 2014; Liu and Treitz, 2016). NDVI data are often used to analyze vegetation productivity and enable an efficient means for spatial and temporal comparisons using time series data (Brown et al., 2006; Yin et al., 2012). These data are now available at a range of spatial resolutions allowing researchers to examine vegetation patterns and processes from local to global scales. There is a vast amount of literature across disciplines that reports on the application of satellite data for monitoring tundra environments. Coarse resolution NDVI time series data are widely used for regional to global vegetation monitoring because of their vast coverage of the Earth's surface at high temporal frequencies (Brown et al., 2006; Fensholt and Proud, 2012; Raynolds et al., 2012; Yin et al., 2012; Forkel et al., 2013; Guay et al., 2014; Epstein et al., 2016). These include several comprehensive studies that have applied AVHRR time series data to demonstrate notable decadal changes in vegetation greenness at northern high latitudes (Stow et al., 2003; Brown et al., 2006; Raynolds et al., 2012; Guay et al., 2014). Jia et al. (2003, 2009) used AVHRR data to investigate the interannual changes of vegetation greenness along latitudinal gradients in the Arctic (i.e., Alaska and Canada) to demonstrate how dominant vegetation types differ across bioclimatic zones. More recently, browning has been prevalent in the Arctic, particularly in Alaska (Epstein et al., 2015, 2016; Phoenix and Bjerke, 2016). Although allowing for repetitive synoptic coverage, AVHRR data are limited with respect to providing detailed information on vegetation structure, function, and type at local and watershed scales because of within-pixel heterogeneity of vegetation cover (Stow et al., 2004; Epstein et al., 2012). To address this issue, intermediate resolution satellite data (e.g., Landsat TM/ETM/OLI) are now being used for more detailed vegetation analyses with a sufficient historical record to monitor change over time. Analyses over large areas using intermediate resolution satellite data in conjunction with ground studies have demonstrated that the homogeneous greening trend observed at coarse scales is quite heterogeneous at finer scales (Raynolds et al., 2013). Ju and Masek (2016) constructed a peak-summer Landsat composite of Canada and Alaska from 1984 to 2012 to compare to the Pinzon and Tucker (2014) GIMMS AVHRR NDVI3g data set. Based on the areal mean, their analyses revealed a 29.4% increase in greening and a 2.9% increase in browning, with the greening trend dominating browning for all cover types. Raynolds et al. (2013) conducted similar Landsat NDVI time series on the Foothills of the Alaska North Slope and found a 5% (statistically significant) increase in NDVI over a 22-year period. Finally, researchers have developed linkages with above-ground biophysical variables for arctic vegetation types using high spatial resolution satellite data (e.g., IKONOS, GeoEye, WorldView-2) in conjunction with ground measurements, which can then be scaled-up to intermediate and regional scales (Stow et al., 2004; Epstein et al., 2012). Using high spatial resolution data for time series analysis is uncommon because of a short time scale, yet these data can be used to supplement coarse resolution time series. For example, Urban et al. (2014) used coarse resolution GIMMS time series data (8 km resolution) to document greenness occurring in Pan-Arctic regions over the past 30 years, while using Landsat data (79 m resolution) and RapidEye data (5 m resolution) to measure woody vegetation cover and vegetation structure over a 40-year time span in local areas of Siberia. Moreover, the authors used different spatial and temporal scales to highlight the changes in land cover as a result of climate-induced trends in the past few decades. Our study examined vegetation conditions over a 30-year time span at Low and High Arctic study sites located at the Apex River Watershed (ARW), Baffin Island, Nunavut (NU), and the Cape Bounty Arctic Watershed Observatory (CBAWO), Melville Island, NU, respectively. Intermediate (Landsat TM/ETM+/OLI) and high (WorldView-2 and IKONOS) spatial resolution remote sensing data were examined to determine if NDVI has changed during the period 1984 to 2015. To address this objective (1) vegetation types for each study site were classified using a supervised approach applied to Worldview-2 and IKONOS satellite data for the ARW and CBAWO respectively; (2) NDVI time series were derived using Landsat data for both study sites (i.e., 1984 to 2015 for the ARW; 1985 to 2015 for the CBAWO) and coupled with high spatial resolution land-cover classifications to identify change associated with specific vegetation types; and (3) climate variables (temperature, precipitation, and GSL) were analyzed to determine if changes in NDVI could be directly linked to trends in these climate variables. This study was conducted at two study sites in the Low and High Arctic: i.e., the ARW, Baffin Island, NU, and the CBAWO, Melville Island, NU, respectively (Fig. 1). The ARW (63°48′N, 68°31′W) is 58 km2 and is characterized by undulating topography ranging from approximately 50 to 300 m above sea level, with the highest elevation located in the northern reaches of the watershed. The ARW consists of sand and gravel glaciofluvial and glaciomarine sediment, which is underlain by Ordovician sedimentary rocks and Precambrian granite-gneiss bedrock (Jacobs et al., 1997; Natural Resources Canada, 2012, 2015). The mean monthly air temperatures in Iqaluit range from 8.2 °C in July to −26.9 °C in January with an annual mean of −9.3 °C, giving rise to a relatively short snow-free period and hence a short growing season (Leblanc et al., 2012). The total annual precipitation, predominantly falling as snow, averages 412 mm (Environment and Climate Change Canada, 2015). The ARW is underlain by continuous permafrost, giving rise to an active layer ranging from 0.5 to 2.0 m depending on the drainage and substrate materials (Jacobs et al., 1997; Leblanc et al., 2012). The average growing season starts in June and ends in August with peak growing conditions occurring in late July (Environment and Climate Change Canada, 2015). According to the Circumpolar Arctic Vegetation Map (CAVM), the ARW is located in Bioclimatic Zone D, yet also contains hemi-prostrate dwarf shrub, which is more common in Subzone C (CAVM Team, 2003; Walker et al., 2005). Five broad vegetation types have been described for the ARW: (1) dry vegetation type (P1)—prostrate dwarf shrub, herb tundra; (2) mesic vegetation type (P2)—prostrate/hemi-prostrate, dwarf shrub tundra; (3) mesic vegetation type (G2)—graminoid, prostrate dwarf shrub; (4) mesic vegetation type (G3)—non-tussock sedge, dwarf shrub, moss tundra; and (5) wet vegetation type (W1)—sedge/grass, moss wetlands (Obradovic and Sklash, 1986; Jacobs et al., 1997; CAVM Team, 2003; Walker et al., 2005). The CBAWO (74°55′N, 109°35′W) consists of two adjacent watersheds spanning 30 km2 exhibiting topographic relief that ranges from 5 to 125 m above sea level. The most common surficial material is weathered bedrock predominantly where linear bands of the Devonian formation and the sediments of the Sverdrup basin are clearly delineated (Edlund, 1993). The site is overlain by glacial till (i.e., Winter Harbour Till) and a thick carbonate-rich till with crystalline clasts draped over the sedimentary bedrock (Edlund, 1993). The mean July temperature and precipitation derived from data collected at the Main Meteorological Station at the CBAWO from 2003 to 2015 is 6.2 °C and 31 mm, respectively (Lamoureux, 2015). The CBAWO is in a continuous permafrost region with an active layer depth of approximately 0.5–1.0 m (Atkinson and Treitz, 2013). The melt season extends from June through August, which limits the short growing season from late June to early August (Environment and Climate Change Canada, 2015). The CBAWO falls within Bioclimatic Subzone B (CAVM Team, 2003; Walker et al., 2005). At the scale of the Circumpolar Arctic Vegetation Map, the vegetation at the CBAWO is classified as G2—graminoid, prostrate dwarf-shrub, forb tundra (CAVM Team, 2003). At the local scale, the vegetation is heterogeneous and varies with drainage. A supervised land cover classification for the CBAWO was completed by Gregory (2011) based on field data collected in 2008 and 2009 and high spatial resolution (4 m) IKONOS data collected on 22 July 2008 (overall classification accuracy = 83%; Kappa = 0.79). Three vegetation types, closely related to distinctive moisture regimes (i.e., along a moisture gradient) were classified: polar semi-desert, mesic tundra, and wet sedge meadows (Gregory, 2011; Atkinson and Treitz, 2012) (Fig. 2). Study locations on Melville Island (Cape Bounty Arctic Watershed Observatory—CBAWO) and Baffin Island (Apex River Watershed—ARW), Nunavut, Canada. Climate data were obtained from climate stations at Mould Bay and Iqaluit for the CBAWO and ARW, respectively. Resolute Bay climate station is included for reference. Field sampling was carried out in the ARW from 20 June to 10 August 2015 (i.e., during the growing season) using methods developed for the international tundra experiment (ITEX) (Molau and Mølgaard, 1996). The sampling procedure was designed to collect in situ percent vegetation cover (PVC) measurements by functional group (i.e., shrubs, graminoids/sedges, mosses, forbs, and lichens) to characterize the vegetation types in the ARW for the land-cover classification. Two transects were sampled at each of seven sites (i.e., for a total of 14 transects) (Fig. 3). Each transect was 100 m in length and oriented across different slope angles to ensure that sufficient data were collected to acquire a representative sample of the vegetation types (and environmental conditions) present in the study site (i.e., vegetation variability across the terrain [elevation, slope, aspect] and moisture regimes). Vegetation data were collected in 6 m × 6 m plots located at 20 m intervals along each transect. Each 6 m × 6 m plot was divided into four sections (i.e., 3 m × 3 m quadrants) and the center of each quadrant was sampled with a 0.6 m × 0.6 m quadrat (Fig. 3). The plots at each transect location were georeferenced and utilized as calibration and validation data for the vegetation classification. The sampling procedure (i.e., plots, quadrants, and quadrats) was designed so that field data could be related to the spatial resolution of WorldView-2 (∼2 m) while being able to “scale up” to a 30 m Landsat pixel used in the NDVI time series analyses. Additional vegetation sites were established approximately every 30 m along routes connecting transect locations to enhance the sample size for image classification (i.e., calibration and validation). Global Positioning System (GPS) coordinates and vegetation descriptions were recorded with representative digital photographs to categorize vegetation types at these locations. Vegetation classification of the CBAWO. This classification was derived from IKONOS high spatial resolution data acquired on 4 July 2008 using a supervised approach (Gregory, 2011). High spatial resolution satellite multispectral data (i.e., WorldView-2) were used in this study to establish a vegetation classification for the ARW (Table 1). The WorldView-2 data (8 spectral channels with a spatial resolution of ∼2 m) were collected at peak growing season on 21 July 2015. The digital numbers (DN) were converted to top of atmosphere (TOA) reflectance using the TOA radiometric correction in the ENVI Image Analysis Software (v. 5.2). The land-cover classification for the ARW was subsequently used to examine the overall greenness by vegetation type over time using intermediate scale remote sensing data (i.e., NDVI data derived from Landsat). Similarly, the classification for the CBAWO generated by Gregory (2011) was used to generate the Landsat NDVI time series by vegetation type. In this sense, both classifications were used to segment the study sites into vegetation types, for which NDVI time series were generated for each vegetation type and for the watersheds overall. Sampling design for the Apex River Watershed (ARW). At seven sample sites, two 100-m transects were sampled using 6 m × 6 m plots. At each plot, the center of each quadrant (3 m × 3 m) was sampled with a 0.6 m × 0.6 m quadrat to estimate percent vegetation cover (PVC). The number and orientation of transects varied at each location in order to sample across environmental and topographic gradients. Right inset—examples of the 0.6 m × 0.6 m quadrats within each plot to determine PVC using the ITEX method. Additional calibration and validation data for image classification were collected while traveling from one transect location to another. For the NDVI time series analyses, cloud-free Landsat TM/ETM/OLI data were collected during the growing season (i.e., between 10 July and 15 August) for the ARW and CBAWO (Table 1). The orthorectified Landsat data (30 m spatial resolution) were downloaded from the U.S. Geological Survey GLOVIS website (USGS, 2015). The red and near-infrared bands were extracted from each image to derive NDVI for each date. The Landsat data were radiometrically normalized to compensate for atmospheric path radiance and errors associated with the use of multiple sensors and images collected at different dates using pseudo-invariant features (PIFs) and regression (Jensen, 2005). This method involves selecting similar PIFs in each image that do not change spectrally over time in order to correct for brightness variations that are related to different atmospheric conditions (Jensen, 2005). First, a cloud-free image was selected as a base image for the time series. Approximately 10–20 dark- and light-colored PIFs (i.e., sandbanks, bedrock, deep water, etc.) were selected in the images by using the region-of-interest (ROI) tool. ROI statistics were extracted from each PIF, and the average reflectance values were recorded. Regression analyses for each band were used to determine the relationship between the spectral characteristics of the PIFs from each image in the time series to the PIFs of the base image (Jensen, 2005). After the image data were normalized, NDVI data were derived using the band math function. The satellite data were masked to include the watershed and exclude roads, rivers, and lakes (Natural Resources Canada, 2015). Additionally, areas of cloud and cloud shadow were manually masked by analyzing large differences in NDVI between scenes. Satellite image data used for vegetation analyses for the ARW and the CBAWO. The asterisk (*) represents dates that could potentially be anomalies within the NDVI time series satellite data (i.e., early or late in the growing season). The land-cover classifications for the ARW and the CBAWO are important in this study to determine if different vegetation types at each site have experienced change over time, and if so, at what rates. It is anticipated that vegetation types defined along a moisture gradient at these sites have responded or will respond differently to changes in climate. The classification procedure for the ARW began by classifying the WorldView-2 imagery employing a supervised approach with the Support Vector Machine (SVM) algorithm to distinguish five spectral classes using the CAVM as a guide. Initially, the calibration locations were separated into five vegetation classes and two non-vegetated classes. However, analysis of the spectral data revealed that only three vegetated and two non-vegetated classes were spectrally separable (i.e., the mesic sites were collapsed into a single mesic site and the non-vegetated classes were combined into a single class of bare ground). The land-cover classification was calibrated using 115 sample sites (total = 923 calibration pixels; 78 dry tundra, 408 mesic tundra, 66 wet tundra, 371 bare ground). Validation of the classification was based on 67 sample sites (total = 596 validation pixels; 99 dry tundra, 324 mesic tundra, 46 wet tundra, 127 bare ground). Binomial probability theory was used to determine a suitable sample size for validation (i.e., expected map accuracy = 85%; allowable error = 10%; minimum sample size = 51) (Fitzpatrick-Lins, 1981). Pixels were randomly selected for each Landsat time series image (1984–2015 for the ARW and 1985–2015 for the CBAWO) based on the vegetation types in the WorldView-2 and IKONOS vegetation classifications; specifically, where there were large homogeneous areas that would be representative for Landsat pixels (i.e., 30 m). Approximately 100 NDVI pixels were selected from each vegetation type for each of the two study sites. A cluster-sampling scheme was adopted because most of the pixels in the Landsat data were in large homogeneous areas. Clustered samples did not exceed 10 pixels for any given sample site in order to minimize bias associated with spatial autocorrelation (Jensen, 2005). Hence, a minimum of 10 independent sample sites (with up to 10 pixels per site) were randomly selected for a total of 100 NDVI pixels per vegetation type. First, the average NDVI values (i.e., of all sample pixels) for each Landsat time series were extracted to determine the overall trend in NDVI for each study site. Second, in order to examine any differences in vegetation growth by vegetation type, the average NDVI values were extracted and averaged for each vegetation type by year. Mean July homogenized temperature (1946–2015) and precipitation (1946–2007) data were acquired from the Environment and Climate Change Canada (2015) archive for the Iqaluit weather station. Similarly, mean July homogenized temperature (1948–2015) and precipitation (1948–2007) data were acquired for Mould Bay (the nearest permanent weather station ∼300 km west of the CBAWO). Anomalies were measured as the residual variations in climate variables to reduce the systematic effect of seasonality over a long-time series (i.e., base periods of 1971–2000 and 1961–1990 for temperature and precipitation, respectively) (Olthof and Latifovic, 2007; Tingley and Huybers, 2013). where Tmax and Tmin are the daily maximum and minimum temperatures and Tbase is 5 °C (GDD is unitless). The GSL was calculated by summing the number of days for which the average temperature exceeded the threshold (5 °C) over the growing season from June to August (Carter, 1998; Førland et al., 2004; Skaugen and Tveito, 2004; Weijers et al., 2013). The supervised classification for the ARW generated a single non-vegetated class and three vegetated classes: (1) bare ground; (2) polar semi-desert (prostrate dwarf shrub/herb tundra); (3) mesic tundra (hemiprostrate/graminoid prostrate dwarf shrub); and (4) wet sedge meadow (sedge/grass moss wetlands) (Fig. 4). The overall classification accuracy was 73.2% (Kappa = 0.53). Mesic tundra dominates the landscape (51.6%) followed by polar semi-desert (27.6 %), bare ground (12.3%), and wet sedge meadow (8.6%). The average NDVI for the ARW over the period of 1984–2015 indicates an overall increasing trend for the watershed, yet this trend is not statistically significant (Table 2; Fig. 5, part a). This trend is driven largely by a slightly increasing trend for the mesic tundra of 0.38% yr-1, albeit not significant. Therefore, there is no distinct change in NDVI at the ARW site over the period 1984–2015. Analyzing the NDVI patterns for each vegetation type illustrates similar increasing trends from 1984 to 2015 with decreases from 2008 to 2011 followed by an increase from 2011 to 2015 (Fig. 5, part a). It is important to note that the 2011 NDVI data for the ARW were acquired early in the growing season (i.e., 10 July) and appear somewhat anomalous, particularly for the wet sedge meadow (Fig. 5, part a). In contrast, the average NDVI for the CBAWO indicates a significant positive trend from 1985 to 2015 for the entire watershed (Table 2; Fig. 5, part b). This overall trend results from significant positive trends in NDVI for the mesic tundra and polar semi-desert with increases of 1.3% yr-1 and 0.82% yr-1, respectively, and a non-significant trend for wet sedge meadow (i.e., an increase of 0.19% yr-1). NDVI patterns for each vegetation type show similar increasing trends from 1985 to 2015 with sharp decreases from 1988 to 1999. Again, it should be noted that the 1999 NDVI data for the CBAWO (which divert from the trend) were acquired late in the growing season (i.e., 14 August) and may have been impacted by cooler temperatures or even the onset of freeze-up (Fig. 5, part b). Supervised land-cover classification for the ARW using high resolution WorldView-2 data. The inset provides a more detailed depiction of the vegetation classes at a larger scale. The results from the NDVI time series indicate an increase in greenness at the High Arctic site (CBAWO) compared to the Low Arctic site (ARW), particularly for the mesic tundra and polar semi-desert. Here, temperature, precipitation, and GSL are examined as potential controls on the NDVI trends observed at these sites. The mean homogenized July temperature and precipitation anomalies for Iqaluit demonstrate variability over the past 60 years with no significant trends (Table 3; Fig. 6, parts a and c). Even after removing the 2015 data point (i.e., an anomaly in the temperature trend) there was no significant trend in temperature over the period studied. However, the mean homogenized July temperature for Mould Bay indicates a significant positive trend over the past 60 years (Table 3; Fig. 6, part b). Meanwhile, the homogenized precipitation illustrates the natural variability in the Mould Bay data (with no clear trend) (Table 3; Fig. 6, part d). Linear regression results for the NDVI time series analysis. Significant trends in bold. (a) NDVI time series by vegetation type in the ARW (1984–2015). The ARW represented in black contains all the usable pixels located in the watershed. (b) NDVI time series by vegetation type in the CBAWO (1985–2015). The CBAWO represented in black contains all the usable pixels located in the watershed. Linear regression results for temperature, precipitation, and GSL time series analysis. Significant trends in bold. (a) Iqaluit homogenized mean July temperature anomalies from 1946 to 2014 (base period 1971–2000) supplemented with the 2015 July monthly temperature anomaly (missing data: 2008); (b) Mould Bay homogenized mean July temperature anomalies from 1948 to 2015 (base period 1971–2000) (missing data for Mould Bay: 1950, 1997, 2002, 2011, 2014); (c) Iqaluit homogenized total July precipitation from 1946 to 2007 (base period 1961–1990) (missing data: 1997–2005); (d) Mould Bay homogenized total July precipitation from 1948 to 2007 (base period 1961–1990) (missing data for Mould Bay: 1993, 1997–2002) (Environment and Climate Change Canada, 2015). The results for GSL for Iqaluit show a slightly increasing trend from 1946 to 2015, albeit not significant (Table 3; Fig. 7, part a). In 2015, there was a large anomaly in the data set, with only 26 GDD, whereas the average throughout the time series is approximately 63 days. It is important to note that if the 2015 data were to be removed, the results would still not indicate a significant positive trend. Conversely, there is an increasing positive trend in GSL at Mould Bay from 1948 to 2015 (Fig. 7, part b). The classification of high spatial resolution remote sensing data was used to segment the study sites into general vegetation types defined along a soil moisture gradient (polar semi-desert, mesic tundra, wet sedge meadow). At the ARW, there is an inherent trend in vegetation types defined by topography, where denser, lusher vegetation tends to be near and just above sea level in the south, whereas sparse and barren vegetation tends to be predominant in the north at higher elevations (Fig. 4). In the southern portion of the watershed, dense vegetation, including shrub, sedge, and forb functional groups, tends to be found along streams, rivers, and lakes, and in concavities or microtopographic depressions. Conversely, in the northern portion of the watershed, rock and thin soils with small patchy shrub and forb species tend to dominate. Topography is the primary control over seasonal soil moisture and is the reason wet vegetation inhabits low-lying areas near permanent snow packs, deep depressions, and areas in close proximity to lakes and rivers. On the other hand, dry vegetation inhabits well-drained areas such as the tops of hills, shallow soils, and exposed areas. Hence, vegetation types, and their spectral response, are largely related to soil moisture (Ostendorf and Reynolds, 1998; Necsoiu et al., 2013; Collingwood et al., 2014). This relationship, that is, the interdependence between terrain, moisture regime, and vegetation type, is also evident at the CBAWO. More broadly, it follows that vegetation types will vary spatially across the Arctic based on moisture availability throughout the growing season, a condition that is susceptible to changes in climate and permafrost condition. Hence, vegetation condition (i.e., NDVI) is a strong surrogate for persistent seasonal moisture regime at high latitudes. In this study we assumed that vegetation types did not change over the time period studied. However, given the warming observed at high latitudes, it seems reasonable to expect productivity of vegetation types to increase (or decrease) over a 30-year time frame. Also, it can be expected that vegetation type boundaries will change over the long term in concert with continued warming (or cooling), changes in moisture regime, and permafrost condition. Hence, classification of vegetation types over longer time periods may provide additional evidence of changes in ecosystem structure and function as longer time series of intermediate and high spatial resolution remote sensing data accumulate. (a) Growing season length from 1946 to 2015 calculated from the minimum and maximum mean daily temperature for Iqaluit A and Iqaluit UA weather stations; (b) growing season length from 1948 to 2015 calculated from the minimum and maximum mean daily temperature for Mould Bay A and Mould Bay CS weather stations (missing data for Mould Bay: 1950, 2014) (Environment and Climate Change Canada, 2015). These terrain and environmental factors control where certain vegetation types reside, giving rise to heterogeneous vegetation types across fine spatial scales. High spatial resolution data are useful for characterizing the fine-scale variability of vegetation signatures, discriminating vegetation type boundaries, identifying areas of disturbance, and enhancing our ability to scale synoptic predictions (Thomas et al., 2002; Stow et al., 2004; Rudy et al., 2013; Cameron and Lantz, 2016; Davidson et al., 2016). While pixel-based classifications have exhibited accurate results in arctic vegetation classifications (Gregory, 2011; Atkinson and Treitz, 2012; Olthof and Fraser, 2014), the classification accuracy for the ARW was moderate. This may be attributed to a more complex terrain (i.e., moisture conditions) and more diverse and abundant vegetation present in the ARW, at least in comparison to the CBAWO. Given the high spatial variability of vegetation types, PVC, and soil moisture in the ARW (i.e., various mixtures of vascular plants, bryophytes, and bare soil and till), relying solely on visible and near-infrared spectral signatures to classify vegetation types using high spatial resolution data may not be sufficiently accurate or precise, particularly when attempting to partition vegetation types along a continuous moisture gradient. New satellites (e.g., WorldView-3) provide high spatial and spectral resolution data that extend through the shortwave infrared (SWIR) and are capable of collecting data in stereo for the derivation of precise digital elevation models (DEMs). These additional data should improve our capacity for classifying vegetation types in the Arctic that are closely related to moisture regime (Bratsch et al., 2016). In addition, the application of other classification methods such as object-based and neural network classifiers may be more applicable to this environment (Chen et al., 2010; Lantz et al., 2010; Collingwood et al., 2014), particularly given their capacity for incorporating additional contextual variables into the classification (e.g., elevation, slope, aspect, texture, wetness, etc.) to further refine the classification of vegetation types (Lantz et al., 2010). It should be noted that these types of studies require field campaigns to calibrate and validate remote sensing data analyses, regardless of the scale of observation (Guay et al., 2014). The mesic tundra and polar semi-desert for the ARW have higher NDVI values than the CBAWO, whereas the wet sedge meadows exhibit similar NDVI values (Fig. 5). This is not surprising given the overall warmer climate in the Low Arctic, which gives rise to higher biodiversity and productivity (Ju and Masek, 2016). The mesic tundra demonstrates different NDVI values between sites. This can likely be attributed to the mesic tundra at the ARW having greater biodiversity and biomass as a result of the inclusion of more vascular plants, including erect, woody shrubs (i.e., Salix spp. ; Dryas octopetala, Cassiope tetragona, Empetrum spp.) than are present at the CBAWO (Hope et al., 1993; Jacobs et al., 1997; Atkinson and Treitz, 2012; Liu and Treitz, 2016). Also, for the polar semi-desert, the ARW exhibits slightly higher NDVI values than those at the CBAWO (Fig. 5). The polar semi-desert at the CBAWO exhibits higher proportions of exposed soil in its polygon structure than those at the ARW. Polar semi-deserts vary across latitudes in that the proportion of exposed soil within this vegetation type tends to increase with latitude as vegetation becomes more sporadic and restricted to small depressions of ice-wedge polygons (Atkinson and Treitz, 2012, 2013; Liu and Treitz, 2016). In general, studies based on satellite observations have reported an increase in NDVI (i.e., shrub expansion and/or vegetation growth) across the Arctic at coarse (Jia and Epstein, 2003; Guay et al., 2014; Epstein et al., 2012, 2016) and intermediate scales (Fraser et al., 2011; Ju and Masek, 2016). Although greening trends tend to be predominant across the Arctic, the rates of greening vary significantly over space and time with some areas exhibiting browning, an outcome that is relatively recent and not well understood (Beck and Goetz, 2011; Guay et al., 2014). It is clear that the productivity of vegetation types across the Arctic (i.e., based on NDVI) is spatially and temporally variable as a result of similar variability of environmental drivers. Epstein et al. (2012) found an increase in aboveground phytomass across the circumpolar arctic tundra in the past three decades using NDVI derived from AVHRR data. The authors determined that the greatest increases in phytomass occurred in the southernmost tundra subzones (C–E), albeit there was a high degree of heterogeneity across vegetation types. Alternatively, in the context of specific bioclimatic subzones and vegetation communities, Jia et al. (2009) found a greater increase in peak NDVI in the High Arctic (0.49–0.79% yr-1; dominated by prostrate dwarf shrubs, mosses, and lichens) compared to the Low Arctic (0.46–0.69% yr-1; dominated by erect dwarf shrubs and graminoids) for the period 1982–2006. The authors suggested this contrast is likely because of different time series examined, indicating a non-linear response of arctic vegetation types to warming and/or cooling trends. For instance, it has been observed that a period of greening can be followed by a period of browning (Epstein et al., 2015). Meanwhile, based on Moderate Resolution Imaging Spectroradiometer (MODIS) data analysis, Miles and Esau (2016) reported relatively equal proportions of greening (8.4%) and browning (9.6%) for a study site in northern west Siberia, with a general consensus that greening tends to be associated with tundra ecosystems and browning with the boreal forest, an observation consistent with other studies (Walker et al., 2009; Epstein et al., 2016). This variable ecosystem response has been linked to temperature and cloudiness by Seddon et al. (2016) based on their analysis of MODIS data over a 14-year period. In this study, Landsat data, coupled with high spatial resolution land-cover classifications, were useful in identifying greenness occurring at landscape scales by vegetation type. The Landsat time series analysis revealed an overall increase in NDVI at the CBAWO at the western extent of the Canadian High Arctic (specifically for the dry and mesic vegetation types) (Table 2; Fig. 5). Meanwhile, no significant change in NDVI was observed for the ARW located at the eastern extent of the Canadian Low Arctic (Table 2; Fig. 5). Landsat data have been used to demonstrate greening in the Arctic; that is, 29.4% of Canada and Alaska demonstrated positive greening (Ju and Masek, 2016). The authors generated a peak-summer Landsat composite from 1984 to 2012 that illustrates precise changes in greening and browning ( http://www.nasa.gov/sites/default/files/thumbnails/image/agstill.3975legend.jpg). 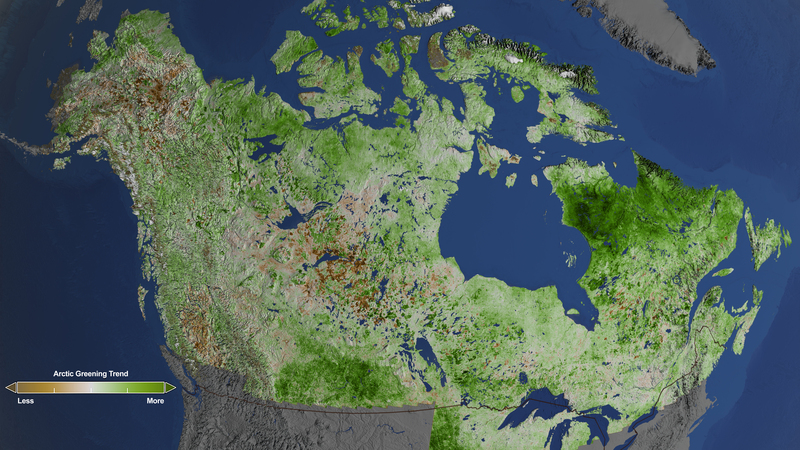 Whereas the tendency for greening is predominant, the trends are extremely variable across latitude and longitude, with some significant browning in the interior of Alaska and central Canada. The results of our study are consistent with the findings of Ju and Masek (2016), where there is a greening trend for the CBAWO and no clear trend for the ARW. Further, a general trend of greening has been reported by Fraser et al. (2011) for four national parks in Canada at various locations within the Arctic (albeit all south of the CBAWO). Specifically, the authors discovered an increase in NDVI specific to the shrub/graminoid vegetation class (similar to a mesic vegetation type); where the increase in greenness occurred in areas of already favorable growing conditions. The authors observed consistent patterns of greening (i.e., 6.1–25.5%) that were attributed to increased fractional shrub and other vegetation cover that was associated with positive temperature trends (similar to our observations at the CBAWO). Epstein et al. (2016) demonstrated greening to be predominant on the North Slope of Alaska, the tundra of southern Canada, and in central and eastern Siberia, whereas browning tends to be prevalent in western Alaska, western Siberia, and the Canadian High Arctic. This result for the Canadian High Arctic may be a function of the scale of observation (i.e., AVHRR), given we observed greening at intermediate spatial scales (i.e., Landsat) for the CBAWO. Analyses of different scales will provide different results, or at least potentially mask trends that are more gradual. For example, Fraser et al. (2011) observed that gradual greening trends observed with Landsat data were not apparent at coarser scales (i.e., 3 km NDVI derived from AVHRR data), likely attributable to spatial averaging, indicating the importance of higher spatial resolution data to characterize vegetation change at regional or local scales. This emphasizes the importance of examining different locations within the circumpolar region at multiple scales in concert with field observations. The static trend observed at the Low Arctic site (i.e., ARW) was similar to a study conducted by Pattison et al. (2015). The authors combined plot-level trends in species composition with fine and coarse spatial resolution NDVI trends in Alaska from 1984 to 2009. At the plot level, none of the five vegetation types that were measured appeared to change in species composition; and in conjunction, the Landsat time series also demonstrated no change in NDVI. Although results in the ARW and the results published by Pattison et al. (2015) demonstrate no significant greening at these Low Arctic sites, not all studies have reported similar results. Fraser et al. (2011) found that all Low Arctic study sites (on the East and West side of the Low Arctic) above treeline were significantly greening using Landsat time series over a 17- to 25-year period. Similarly, Raynolds et al. (2013) observed a significant increase in greenness on the North Slope of Alaska (from 1985 to 2007) using Landsat data, and Epstein et al. (2012) found a 19.8% increase in aboveground biomass from 1982 to 2010 using AVHRR data based on vegetation subzones. The area of most notable change was documented in the Low Arctic. Again, this variability observed for the Low Arctic can be attributed to the location of specific studies as well as the scale of observation. Hence, we need to be careful to consider spatial and temporal scales when generalizing trends of greening and/or browning for any given location, particularly at broad scales. The inherent change in NDVI across the Canadian Arctic and for specific vegetation types has been linked to July temperatures and GSL. In some areas of the Arctic, where temperatures tend to be increasing, growing seasons tend to lengthen, leading to enhanced greening (Tucker et al., 2001; Cooper et al., 2011; Bieniek et al., 2015; Moffat et al., 2016). Gamon et al. (2013) agreed that GDD, local environmental conditions, and temperature are primary factors determining arctic vegetation productivity. Further, the SWI has also been linked to increases in NDVI using coarse resolution satellite data of the circumpolar Arctic (Jia et al., 2009; Bhatt et al., 2013). Bhatt et al. (2013) also stated that from 1982 to 2011, at a Pan-Arctic scale, summer (May–August) land surface temperatures and NDVI increased in concert with an increase in open water. Raynolds et al. (2008) found that the regression of NDVI as a function of SWI showed a highly significant positive relationship, where a 5 °C increase in the SWI corresponded to a 0.07 increase in NDVI (i.e., corresponding to increases in growing season temperatures) over the entire Arctic. Our results support the close relationship between significant increases in temperature, GSL, and NDVI (Tables 2 and 3; Figs. 5, 6, and 7). The contrasting climate trends observed at the two study sites (Figs. 6 and 7) support the increase in NDVI at the CBAWO compared to the lack of an NDVI trend at the ARW (Fig. 5). ACIA (2004) and IPCC (2013) each stated that the mean annual and winter temperatures along the west coast of the Arctic are generally higher than those at latitudes inland or on the east coast because of Arctic, Pacific, and North Atlantic Oscillations. For example, the North Atlantic Oscillation demonstrates a trend favoring the positive phase over the past four decades resulting in colder temperatures in the east (IPCC, 2013). In some studies, winter temperatures and snowmelt timing have been found to correlate with vegetation growth the following summer (Myers-Smith et al., 2011). The results reported here suggest that compared to the ARW (an eastern Low Arctic site), there was proportionately more greening at the CBAWO (a western High Arctic site), which can be attributed, in part, to higher summer temperatures (Fig. 6, part b) and an increased GSL (Fig. 7, part b). Results like these can be applied to validate and project the impacts of a changing climate as predicted by GCMs, and can be used to examine where vegetation changes can be anticipated over the coming decades. However, although greening may be occurring in large portions of the Arctic (indicating increasing productivity of arctic biomass), evidence suggests that this greening will not offset the release of organic carbon due to decomposition, combustion, and hydrologic export (Abbott et al., 2016). Given this positive feedback scenario, it is expected that the Arctic will become a carbon source to the atmosphere, regardless of the warming scenario. Hence, not only is monitoring of the vegetation response important, as examined in this study, we need to better model carbon flux within and between vegetation types that are responding differently across the Arctic. Monitoring vegetation change in the Arctic is an important process for examining the variable impacts of a warming climate. Due to the vast expanse of the largely uninhabited Arctic, remote sensing techniques must be employed at various spatial and temporal scales to examine and quantify this change. This has become somewhat routine at circumpolar scales using coarse resolution satellite data. In this study, mapping and analyzing heterogeneous arctic landscapes at intermediate and high spatial resolutions was beneficial for characterizing how specific vegetation types (defined along a moisture gradient) have (or have not) changed over time in the context of climate change. NDVI time series were derived using intermediate spatial resolution data (i.e., Landsat) at Low and High Arctic study sites. The NDVI time series for both sites were coupled with high resolution land-cover classifications in order to identify specific vegetation types and quantify their response to climate. The results for the CBAWO (1985–2015) indicated a significant positive trend in the mesic tundra and polar semi-desert vegetation types, whereas no significant trends were observed in the ARW. Temperature, precipitation and GSL were analyzed in an attempt to identify the primary environmental variables driving the increases in NDVI at the CBAWO. The mean July temperature trend increases significantly at the CBAWO (based on climate data from Mould Bay). Similarly, there is a significant positive trend in GSL for the CBAWO. It therefore seems apparent that there is a link between changes in NDVI, mean July temperature, and GSL at the CBAWO (i.e., High Arctic). Meanwhile, no significant trends in NDVI or any of the climate variables examined were observed for the ARW. Whereas increasing temperatures and GSL may be driving enhanced productivity at the CBAWO, the climatic trends at the ARW may be largely driven by climate oscillations (i.e., Arctic, Pacific, and North Atlantic Oscillations), thereby dampening the potential change in the eastern Low Arctic. The authors gratefully acknowledge financial support from ArcticNet, the Northern Science Training Program (NSTP), the Natural Sciences and Engineering Research Council (NSERC), and Queen's University, Kingston, Canada. We sincerely thank the Nunavut Research Institute for providing logistical support for this research. The authors thank Drs. Scott Lamoureux and Melissa Lafreniere for the support of this research for the Apex River Watershed, Baffin Island, NU. The authors also thank Nanfeng Liu for his contributions to the field data collection. Treitz thanks the Director, Dr. Peter Sköld and the faculty and staff of the Arctic Research Centre at Umeå University (ARCUM) for their support of this research during his tenure as a visiting researcher. The authors gratefully acknowledge the efforts of two anonymous reviewers for their thoughtful comments.